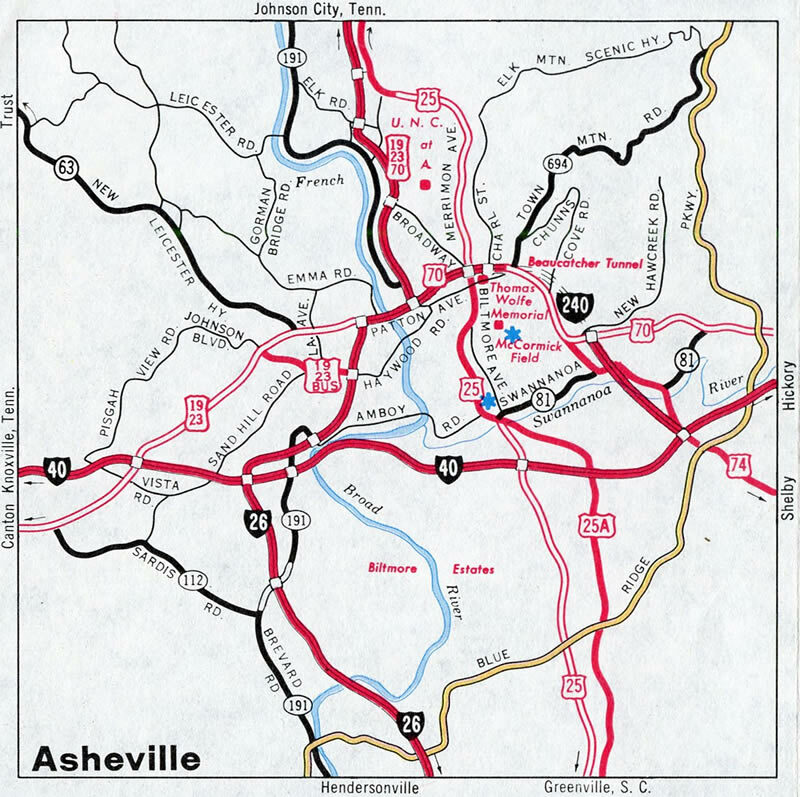 Interstate 240 comprises an urban loop from Interstate 40 through Asheville. 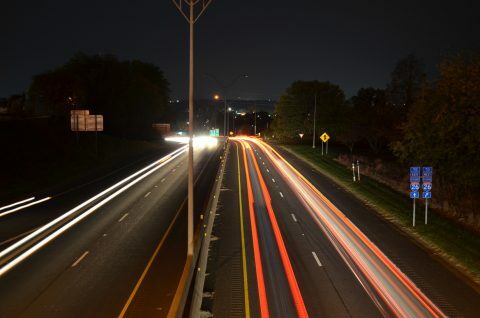 The freeway handles commuter traffic through West Asheville and Downtown and also disperses Future I-26 traffic south from Weaverville and Woodfin to points west and east along I-40. The western half of I-240 takes a convoluted path as it utilizes a portion of original bypass routes constructed for U.S. 19 and 23 east to U.S. 70 east and Town Mountain Road (NC 694). The western terminus of Interstate 240 also marks the historic west end of Interstate 26. I-26 was extended north along the U.S. 23 corridor to Johnson City on August 5, 2003. This resulted in a four mile overlap with I-240 through West Asheville, where cardinal directions are posted opposite for each route. Interstate 240 heads west from the Montford Avenue overpass to a directional T interchange with the U.S. 19-23-70 (Future I-26) freeway and Patton Avenue outside Downtown Asheville. Photo taken October 25, 2015. The final section of I-240 completed linked the original U.S. 70 bypass of Downtown with U.S. 70 along Tunnel Road. This portion bypassed the two-lane Beaucatcher Tunnel along U.S. 70 & 74. Interstate 240 opened in stages between the early 1960s and 1980. AASHTO approved the establishment of the route on July 13, 1976. U.S. 74A parallels the Swannanoa River southeast from Asheville Mall to intersect N.C. 81. The US route turns southwest from there to combine with the eastern extent of Interstate 240 between Exits 8 and 9. Photo taken by Chris Patriarca (06/19/03). The Interstate 240 eastbound mainline defaults onto I-40 east via a wye interchange south of Fairview Road (U.S. 74A). The control city for I-40 is Statesville from I-240 east, but Hickory elsewhere in the Asheville area. Photo taken by Chris Patriarca (06/19/03). Traffic partitions into two-lane ramps for Interstate 40 east to Hickory, Statesville and Winston-Salem and the remaining freeway to I-40 west and the continuation of U.S. 74A southeast to the Blue Ridge Parkway. Photo taken by Chris Patriarca (06/19/03). The ensuing off-ramp joins Interstate 40 west across the Biltmore Estate to Canton and Knoxville, Tennessee. Photo taken by Chris Patriarca (06/19/03). Interstate 240 lowers below a CSX Railroad line and the I-40 mainline ahead of the freeway end at Gashes Creek Road. I-40 travels west 118 miles to Knoxville while U.S. 74A meanders southeast 18 miles to Bat Cave. Photo taken by Chris Patriarca (06/19/03). An end shield stands between the U.S. 74A (Charlotte Highway) intersection with Gashes Creek Road and the Blue Ridge Parkway on-ramps. Photo taken 12/31/13. U.S. 74A (Charlotte Highway) transitions into Interstate 240 west at the turn off for Gashes Creek Road and the eastbound on-ramp to Interstate 40. Photo taken 10/24/15. A loop ramp follows from I-240 & U.S. 74A west for Interstate 40 west toward Knoxville, Tennessee. U.S. 74A splits from the freeway at a parclo A2 interchange with Fairview Road a half mile to the north. Photo taken 10/24/15. Little Cedar Mountain appears to the east as Interstate 40 advances east from U.S. 25 Alternate to the three-quarter cloverleaf interchange (Exits 53A/B) with U.S. 74A (Charlotte Highway) east and Interstate 240 & U.S. 74A west. Photo taken 10/23/15. Interstate 40 curves northeast by the Oakley community to the ramp departure of Exit 53A for the scenic drive along U.S. 74A (Charlotte Highway) east to Bat Cave, Chimney Rock and Lake Lure. Photo taken 10/23/15. Exit 53B loops away from I-40 east to U.S. 74A west to adjacent Fairview Road and Interstate 240 west to Downtown Asheville. Photo taken 10/23/15. Interstate 40 runs along the north side of Hemphill Knob to the wye interchange (Exit 53B) with Interstate 240 & U.S. 74A west to Asheville. Photo taken 10/23/15. U.S. 74A was designated in 1994 when the parent route shifted onto a new freeway to Columbus. The alternate route east connects with the Blue Ridge Parkway nearby and suburban areas to Fairview. Westward U.S. 74A parallels Interstate 240 as a local route to Downtown Asheville. Photo taken 10/23/15. Exit 53B parts ways with Interstate 40 west ahead of the cloverleaf interchange with U.S. 74A (Charlotte Highway). U.S. 74A follows Fairview Road to an adjacent array of retail anchored by Asheville Mall while I-240 bee lines northward to Beaucatcher Mountain. Photo taken 10/23/15. Replaced sign bridge for Exits 53B/A on Interstate 40 west. Photo taken by Chris Patriarca (06/19/03). A wye interchange adds traffic to I-26 east & 240 west from Amboy Road just prior to the off-ramp (Exit 1B) for North Carolina 191 (Brevard Road). N.C. 191 provides the connection to Interstate 40 east as the forthcoming exchange between the two freeways is incomplete due to area topography. Photo taken 12/31/13. Spanning Hominy Creek, a third lane opens westbound for the upcoming ramp (Exit 31B) for Interstate 40 & U.S. 74 west to Canton. Prior to the 2003 extension of I-26, the westbound ramp was assigned as Exit 1A. Photo taken 12/31/13. Interstate 240 west ends as the freeway mainline continues southward as I-26 & U.S. 74 east to Asheville Regional Airport (AVL), Hendersonville and Columbus. Photo taken 12/31/13. Interstate 26 & U.S. 74 west make an S-curve across Hominy Creek on the half mile approach to Interstates 40 and 240 east. An $11.9 million project replaced the bridges over Hominy Creek, with work completed in fall 2016.5 A sign bridge for the upcoming ramps (Exits 31B/A) to I-40 was removed during that construction, which is part of a long term expansion plan (through 2025) for I-26 throughout Buncombe and Henderson Counties. Photo taken 10/23/15. Sign replacements made at Exits 31A/B added Biltmore Estate for I-40 east and Johnson City for the continuation of I-26 west onto Interstate 240 east. Interstate 40 passes through the Biltmore Estate, which spreads to the east and south of the French Broad River nearby, to Morganton and Hickory. Photo taken 10/23/15. A left-hand ramp follows for the continuation of U.S. 74 west along Interstate 40 to Canton and Lake Junaluska. Interstate 26 overlaps with I-240 from this point northeast to West Asheville and Downtown. Ensuing exit numbers reset to U.S. 19-23-70. Photo taken 10/23/15. Former diagrammatic sign posted at the Interstate 26 & U.S. 74 westbound ramp for I-40 east. Prior to sign changes made in July and August 2003, I-26 ended opposite the eastbound beginning of Interstate 240. Photo taken by Carter Buchanan (06/00). See the original western terminus of Interstate 26 for additional coverage. Interstate 40 east at Interstate 240, just prior to the signing of I-26 north to Johnson City, Tennessee. Photo taken 08/23/03. See the Interstate 26 guide for additional photos covering the joint termini of I-26 west and I-240 west in this direction. Heading east from U.S. 19-23 and Enka, Interstate 40 & U.S. 74 advance with four lanes to the directional interchange (Exits 46A/B) with I-26 and I-240 east. Photo taken 10/23/15. Back to back lane drops occur at the succeeding ramps for Interstate 26 & U.S. 74 east to Hendersonville and I-26 west & 240 east to Downtown Asheville. Future road work will upgrade the substandard interchange to include a high speed flyover departing from the right to Interstates 26 & 240 through Asheville. Photo taken 10/23/15. Interstate 26 extends south from the west end of I-240 as an busy commuter route to Fletcher and Hendersonville. I-26 also acts as a gateway to the Appalachian Mountains from South Carolina and the Southeast coast. Photo taken 12/31/13. Exit 46B follows as a left-hand ramp for the winding freeway of Interstates 26 west & 240 east through West Asheville. I-40 continues east as a four-lane freeway across the Biltmore Estate to the communities of Biltmore and Oakley. Photo taken 10/23/15. Interstates 40 and 26-240 parallel one another to respective interchanges with North Carolina 191 (Brevard Road) as they run along side the French Broad River. N.C. 191 constitutes a surface route connection from I-40 west to I-240 east presently. 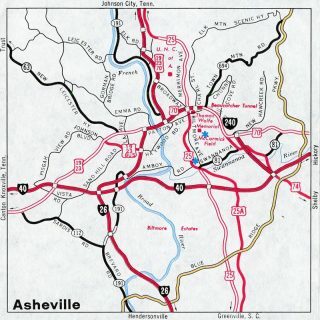 A new collector distributor roadway will be built further west to provide direct access to the Asheville loop as part of Section C of the I-26 Connector project. Photo taken 10/23/15. I-26 Connector, Asheville, NC Public Information Website. NCDOT. “Answer Man: I-26 bridge work over Pond Road halted?” Citizen-Times (Asheville, NC), February 17, 2016.